It has been my experience that normally recipes contain the ingredients in their names. If I create a Brussel Sprout Corn Surprise (I would never do this), it would almost certainly contain brussel sprouts, corn, and some sort of surprise. That’s how the English language works. That’s why I was very confused when I first read the original recipe for this Hot Pepper Noodles dish. It sounds delicious and fast, but the ingredient list didn’t actually contain hot peppers. It had some chili oil, sure, but I hardly count that as enough for a dish with “Hot pepper” in the title. So, I took some liberties with the recipe and just upped the flavors in general, but also made sure to toss in some actual hot peppers. 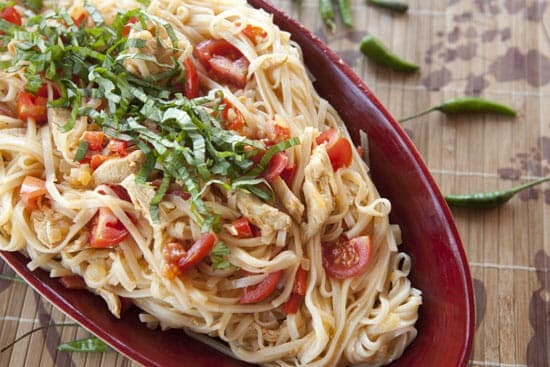 Rice noodles tossed with spicy veggies and a delicious sauce. A very quick stir-fry noodle dish that has big flavor. 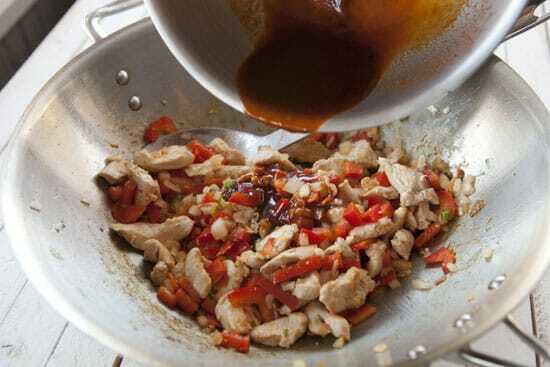 1) For sauce, stir ingredients together in a small bowl and set aside for alter. 2) Prepare all your other ingredients before you start cooking: Dice chicken and veg. Mince the chili peppers and garlic very fine. 3) Cook rice noodles according to package instructions. 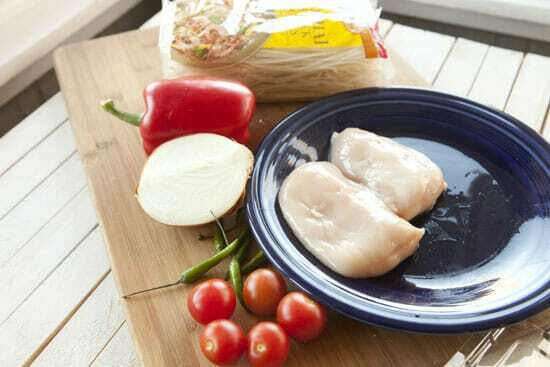 Once cooked, drain, rinse with cold water, and toss with sesame oil to prevent sticking. Set aside. 4) Heat a large wok over medium-high heat. 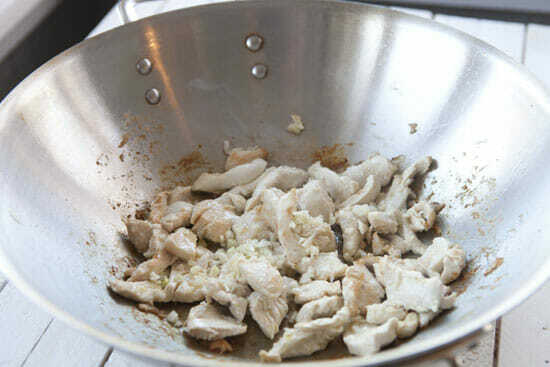 Once hot, add the oil and chicken and cook until the chicken is just cooked through, about 4-5 minutes. 5) Add onions and garlic and continue to cook. Be careful not to burn the garlic. 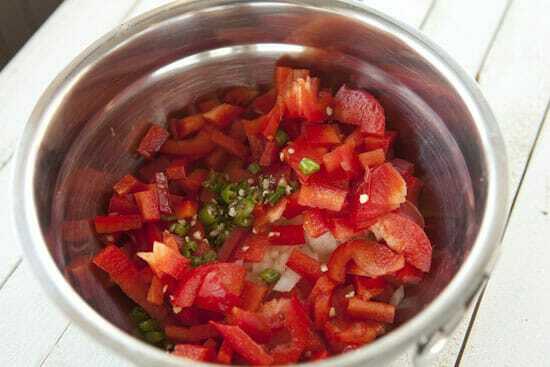 6) Add peppers and half of the sauce and cook for 30 seconds. 7) Add noodles and rest of sauce and toss to combine. 8) Make a well in the middle of the noodles and add beaten eggs. Let cook for 30 seconds so eggs can firm up a bit. Then stir together. 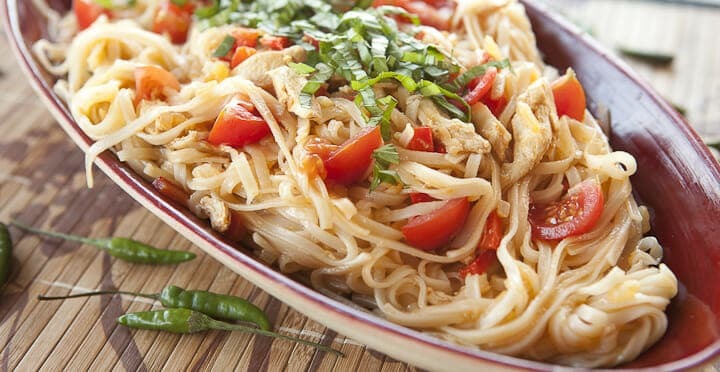 9) Serve noodles immediately garnished with fresh basil. Roughly adapted from a Bon Appetit recipe. As with any stir-fry style dish, I always recommend prepping all your ingredients before starting to cook because the dish cooks really fast. Dice your onions and red peppers and then mince the garlic and chili peppers (I used bird chili peppers but Serrano peppers would work also). 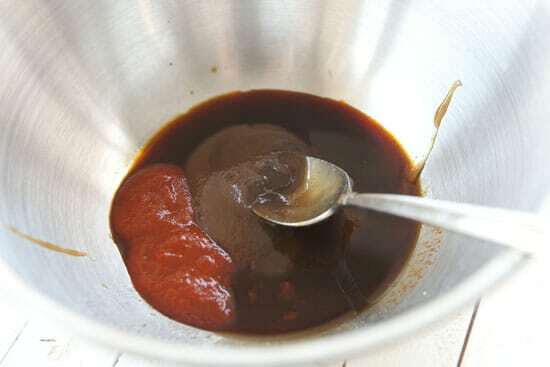 The sauce is a really basic combination of chili-garlic sauce, hoisin sauce, or soy sauce. The original recipe actually used oyster sauce, but I subbed hoisin sauce because I had it in my fridge. Good flavors either way you go. Prep all of this stuff and then you can start focusing on the cooking. 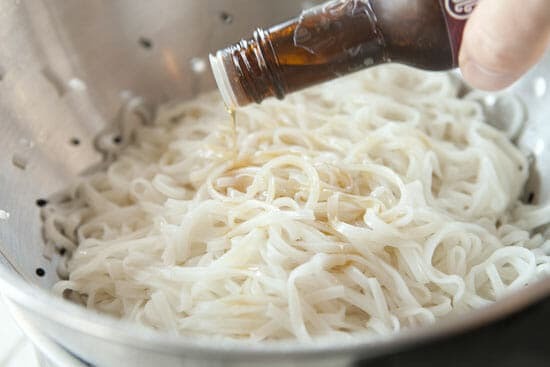 Rice noodles are really catching on these days thanks to the gluten-free craze. You can get them in varying widths from very thin to big and fat. I went with a medium-width noodle for this version. 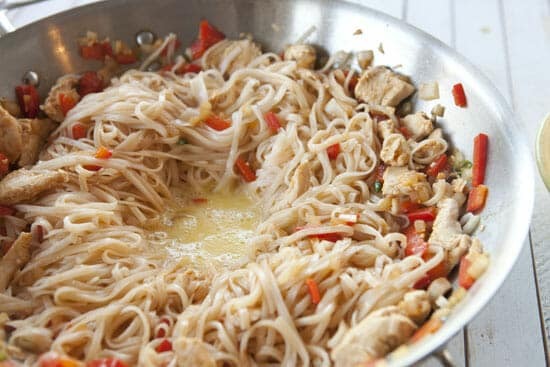 I wouldn’t use the super-thin noodles for this version, but whatever you decide, just cook the noodles according to the package and then rinse them with cold water and toss them with some sesame oil which will keep the noodles from sticking together. When you’re ready to cook, get your wok or large skillet hot over medium-high heat. Add the oil and chicken and cook until the chicken is cooked through, about 4-5 minutes. It should cook very fast. If you didn’t want to use chicken, you could use pressed firm tofu or tempeh. Then add in the garlic and onions and continue to cook for a minute or so until the veggies are soft. Be careful not to burn the garlic. If stuff is really sticking to the pan, feel free to add a bit more oil. Then add in the peppers and half of your sauce. Continue to cook this down for a minute or two, stirring constantly. Next, add in the cooked noodles and the rest of the sauce and toss everything together. Then make a big well in the middle of the pan and pour in your scrambled eggs. Let these cook for a minute so the eggs can firm up a bit, then stir everything together. That’s it! At the very end of the cooking, add in the cherry tomatoes so they are still pretty fresh, but slightly warm. Dish done. Serve it as soon as possible, garnished with lots of fresh basil. The day I make a dish with “hot pepper” in the title that doesn’t actually include any hot peppers is the day I’ll hand over my food blogging badge. In all seriousness though, this is a delicious dish and takes less time to make then if you ordered the same noodle dish take-out. It’s a no-brainer to give it a shot. Following your blog has helped me add a few Asian flavored noodle dishes to my repertoire. This looks like another winner! With another blizzard descending upon Minnesota, this might just make an appearance on my dinner table tonight. I am addicted to hot ‘n’ spicy lately and this looks perfect! It’s so bad that I’m inventing new things to dip in Sriracha mayo. I adore your blog. I seriously hope to see a cookbook from you soon. This looks so good! It’s definitely going on my dinner menu for next week. My kinda food but yes, if I ordered this in a restaurant I’d be looking for my hot peppers!! You are peeking in my fridge! I have two tubs of grape tomatoes calling out to be used, as well as rice noodles in the cupboard. I have peppers, but no fresh basil. Might have to settle for dried basil this time. Thanks for the idea! What would be the best pepper to sub for the bird Chilis? My grocery store is pretty lame and generally only stocks the basics, jalapeños, serranos, habaneros etc. I would say Serranos are best… probably 2-3 depending on how hot you like it. Good luck!